The Atmos Vaporizer - A Simple Vaporizer With Insane Performance! Home → Vaporizers → Atmos Vaporizer Review – Is It The New King Of Vaping? Atmos Vaporizer Review – Is It The New King Of Vaping? 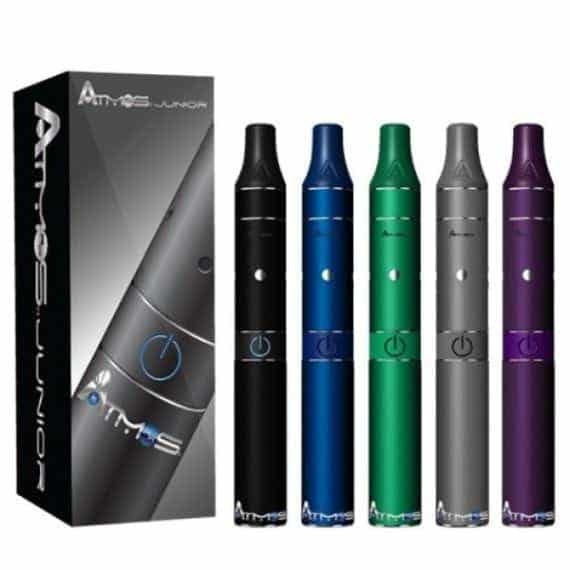 As the vaporizer industry grew and underwent changes, Atmos Nation, LLC, popularly known as Atmos, seized the opportunity to develop portable vaporizers and ever since, they’ve remained a company to beat when it comes to portable pen vaporizers. If there’s one thing to be relished about Atmos then it’s the thorough quality testing all their products have to pass through. Just by taking a look at its build quality, you can tell the Atmos Rx was made to last. Having been made out of stainless steel and aluminum, it can withstand tough punishments, including even a fall from clumsy hands or someone stepping on it. 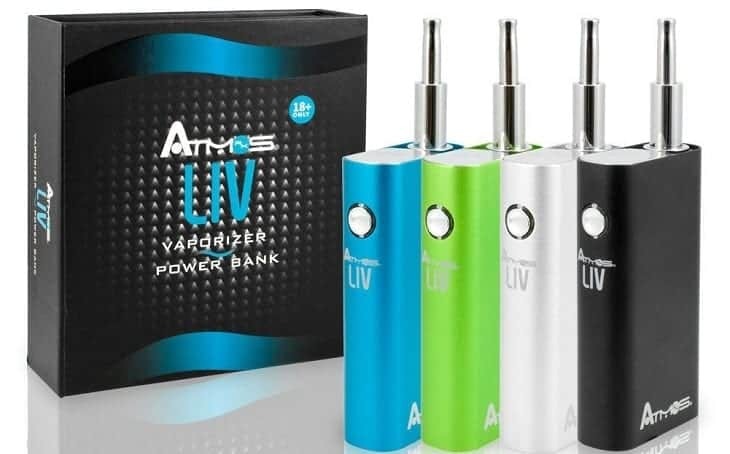 Also included with the product is a scratch and check code which you verify on their official Atmos website to ensure your product is not one of those counterfeits strewn all over the vaping market. The unit comes in 8 colors and with its interchangeable components, you can create multiple color combinations to match your taste. But is that all? Definitely not. There’s so much you need to know about the Atmos Rx so keep reading our atmos vaporizer review to find out. Unlike the plastic or glass components we are used to, the Atmos Rx goes for the more solid materials by including stainless steel as well as aluminum to give it a longer life. Much effort was also put to make it aesthetically appealing, as can be seen in its sleek appearance and compactness. It’s one of those discreet vape pens you can carry with you anywhere and itch to show it off to your friends. No temperature control settings have been included but thanks to its unique ceramic chamber, expect remarkable flavor and vapor quality. I’ll tell you more about this later in our Atmos Vape Pen review. Add on its incredible battery life plus a couple of other advanced features included with it and you’ll easily why it’s well worth its price. So many reasons lead to us needing a discreet vaporizer and with this unit, you have the chance not to put your smoking habits on display or attract all the attention to you. It looks almost similar to an electronic cigarette yet its elegant and so sleek to even fit professionals or anyone who would wish to enjoy their herb with class. Even before you shake off your fascination with its beauty, firing this device up will usher you into another experience altogether. It will heat up your dry herb thoroughly and this will lead to the release of a chain of potent hits. You don’t even need to worry that your dry herb is going to be burnt up. In addition to that, it heats up so fast. In just under 5 seconds you’ll be vaping, which makes it ideal for those who wish to smoke on the go. Not forgetting to mention its powerful battery. It actually lasts longer than other vaporizer pens in its class and so for those who want to vape throughout their day, you are guaranteed satisfaction with this unit. One exceptional feature the makers of this unit gave it was its wickless design. You are definitely going to love the fact that it’s able to distribute heat evenly which ensures consistency not only in the throat hit but also smoke quality. Unlike other vaporizers that utilize the conduction methods, this pen won’t burn your herb until it starts giving out funny smells. Between the herb and the heating element, there’s a glass screen which is the reason why the herb heats just enough to give you the real taste of the herb. This is the reason why every other Atmos dry herb vaporizer review express so much love for the unit’s smooth and consistent vapor. If your preference is waxy oil, the Atmos Rx vaporizer has you already covered. It’s designed to work with both dry herbs as well as waxy oils. Fortunately, this unit won’t require you to switch the tank when you want to go try out another medicine. You can vape your flower now and the next minute switch to a rich wax without actually stopping to change, leave alone clean your tank in between. On quality and design, the Atmos Rx vaporizer scores so high and you are definitely not going to moan about its price. Think of its unique wickless design, the solid ceramic heating chamber, and many other quality items included with it such as the glass screen filters. Not to mention all the important parts you require to vape both your dry herb as well as waxy oil. By the time you actually come to the end of this Atmos Rx dry vaporizer review, you will be more convinced than ever that it’s really worth its price. Not everyone is going to easily fork out $100 or thereabouts for a vaporizer pen, especially those on a tighter budget. So even though this unit is well worth the price, some users might just end up going for a cheaper alternative. Lack of adjustable temperature control settings means that vapers only control their hits by holding down the button and regulating their breath. Nonetheless, in about 10 seconds, the chamber can heat up to 375 Fahrenheit. 400-degree is the highest it can go. Even though the pen utilizes conduction heating via a ceramic chamber, there are a few features that set it apart from the rest. First off, it uses a wick-free design. So in spite of using some small spring inside its chamber, the wick has totally been done away with. On top of that, it features a handmade ceramic heating core and as we earlier in our Atmos Raw Vaporizer review, it also lets users use both wax oils and dry herbs. Many vaporizer pens only allow either, hardly do you find one allowing vapers to use both medicines. At its bottom, it has a heating disk that’s going to burn your herb smoothly and evenly and for those who wish to vaporize their herbs, you have the option to use a glass screen filter. Another important thing to do when vaporizing is to ensure you stir the herb with a packing tool included with the kit. 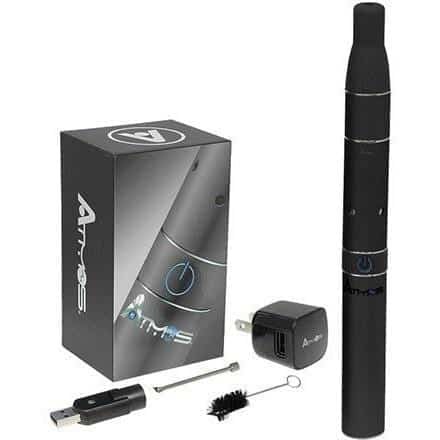 Want more tips on how to use the Atmos RX vape pen? Please check out the video below. Earlier units of this vaporizer didn’t come with glass screens. Only recently was the feature included and besides assisting your herb not to be burned, another great use of this glass screen filters is the added protection they give to the coil. Your wax oils and dry herbs won’t easily get clogged to it and even when you want to clean it, that’s going to be just another easy task. Take care not to interfere with the coil when doing all that. Also note that the glass filter is quite tiny and really invisible and so once it falls on the ground, you’ll have a hard time finding it. Power is definitely a big deal for any vaporizer pen. The Atmos RX doesn’t disappoint as its lithium-ion battery comes with an extended lifespan that can last you up to 72 hours. Charging this unit is pretty easy. You can plug it into a USB port or AC outlet and 1-2 hours later, your unit will be fully charged. A single charge can actually last you roughly 60 draws. Avoid overcharging the battery as that might reduce its life. Currently, we have so many vaping pens scattered all over the vaping market but not all of them have what it takes to deliver a smooth vaping experience. Just as we’ve seen in our Atmos vaporizer review, there’s quite a number of features that set the Atmos Rx apart from others. Professionals or users with extremely busy lifestyles are going to find the unit’s compact, sleek and discreet design just perfect for their lifestyle. Earlier on in our Atmos pen review, we also saw that the addition of a wick-free design plus the inclusion of a glass screen did indeed add to the quality of the vapor produced. The vapor is itself clean and smooth and throughout your sessions, you will not be subjected to the burnt taste common with other vape pens when the tank is on the verge of being empty. All of these can be attributed to the fact that the makers of this product naturally employ tough quality control measures just to ensure that the end product doesn’t disappoint on any front. Price is a little bit on the higher side but our Atmos Rx vaporizer review can justify that. If you look around the market, you are sure to find cheaper alternatives but hardly will you find any of them that matches up to the overall performance of the Atmos RX. Lastly, the Atmos RX affords you the opportunity to use both waxy oils and dry herbs and so you are not going to waste time switching between vape pens or even the tanks. Everything in regards to this is just simple, quick and efficient.